Marc Hudson on the current state of play in the United Kingdom. From the march last Saturday, to a historical digression, to Industry and Government to Paris. There was a climate march in London on the weekend, that the organisers said they were hoping would be the biggest ever in the UK. (For the record, it would therefore have to be bigger than the 50 to 60 thousand march in December 2009, before the Copenhagen climate talks. To get that number took all the big NGOs all year to the exclusion of pretty much everything else). Their hopes were, predictably enough, dashed. My rule of thumb is to double the police estimate and half the organisers’ estimate. This tends to leave a narrow (and accurate?) band. So, for this march we have the Daily Mail (a proxy for the police) using Press Association info, as saying 5000 and “Socialist Resistance” (insert Voltaire-about-the-Holy-Roman-Empire gag here) saying 25,000. So, somewhere from 10,000 to 12,500, probably. 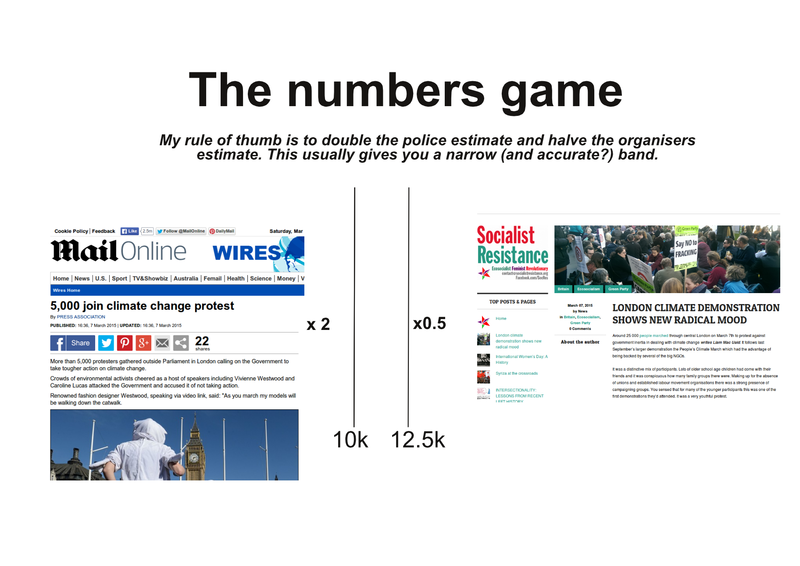 Whoever wrote the headline “Tens of Thousands Take to the Streets of London Demanding Action on Climate Change” (Devlin, K. (2015) needs some remedial maths, basically. Misplaced concreteness aside, the crucial thing is this – marches don’t build social movements. If they did, we would not be in this mess. We would have continued after December 2009 with a bigger and bigger social movement on climate change, wouldn’t we? We would have vibrant and threatening-to-the-powers-that-be social movements, bending the emissions curve down (and not just because we exported our factories). We don’t. Why? Because Marches. Don’t. Build. Social. Movements. But they do keep organisers busy and motivated, and the newspaper sellers happy. So that’s alright then. The latest surge came almost 20 years later. In the period 2006/7 there was a flurry of activity –the launch of the EU Emissions Trading Scheme, Al Gore’s “An Inconvenient Truth”, The Stern Review, the Climate Camps started, the Fourth Assessment Report of the IPCC, the first climate change election (Australia 2007) the “Bali Roadmap” for a global deal in Copenhagen in 2009.” It all disappeared like a fist when you open your palm in 2010. So, we have three fairly distinct surges, roughly twenty years apart (enough time for a new generation to come up, not cynical about the possibilities of change in situations of ‘agentic deadlock‘). Each ends with legislation/failed efforts that fix the problem. And is followed by a lull when only the (fool? )hardy continue to agitate. My suspicion, hopefully totally wrong, is that we are in the early stages of another lull. Of course history doesn’t repeat (though she rhymes), and perhaps the next few years will see a huge upsurge in concern and activity. But disasters and rapid warming (as predicted by Michael Mann, who has had a look at the Pacific Decadal Oscillation and doesn’t like what he sees) don’t automatically lead to political upsurges. And remember, so far social movements on environment have only “succeeded” in creating legislation and formal institutions. They have not caused the same cultural shifts that we have seen around black civil rights, women’s liberation, gay rights (of course, those movements are partial as well, with many adherents justifiably depressed about the speed and direction of change). I am not a close observer, but seems to me only the off shore wind industry is gaining much traction in the much vaunted ‘green economy’. For other sectors the low carbon agenda seems to have just been tossed in the ‘too hard/not currently relevant to our customers’ basket. I hope I am wrong and that someone points out vibrant R and D etc. They are not the historical actor. Not much to say here that isn’t obvious. Despite the (long forgotten and slightly embarrassing) promises of ‘greenest government ever’, it lacks motivation, momentum, credibility and capacity. This last one is crucial. Say we have Prime Minister Miliband in two months, governing with the support of three bolshy Green MPs. So what? The state – both national and even more obviously local – has been progressively hollowed out, its capacity to act strangled. At this point I’m supposed to mouth some pieties about Gramsci’s “optimism of the will”, or point to positive noises from Beijing ahead of Paris. Failing that, I’m supposed to say “batten down the hatches”. But that is a metaphor that works for storms which pass, not ones that grow and grow, propelling us irresistibly into the future to which our eyes are turned, while the pile of debris before us grows skyward. Although we are supposed to be an ‘intelligent’ species there are, obviously, limits to our intelligence. Most people don’t seem to be able to think outside of their normal,everyday experience in terms of time-scales. I suspect that part of the problem may be down to the fact that climate change may be happening on a different time-scale to peoples’ normal, everyday experience. Or, perhaps, everyone ASSUMES that it does … and it will catch us out … possibly …? I am a sceptic… on whether humans can accurately describe themselves as intelligent. I am reminded of the clip from Monty Python’s “Holy Grail” – where they look out the window and see the attackers in the far distance, look again later – still in the far distance, look again – far distance… and then, BAM.